Difference between revisions of "When did Americans begin to get obsessed with weight loss?" Between the late 19th and early 20th century weight shifted form an issue under the umbrella of health, to one under the umbrella of beauty. Diet shifted from meaning the “foods one ate” to a restrictive regimen aimed at reduction. In the late 19th century, discussions about food and diet were centered on health. For example, when the Los Angeles Board of Health Commissioners referenced the possible spread of Asiatic cholera, they offered a plethora of hygienic recommendations to stifle the spread of this disease—including hygienic food and drink recommendations. These recommendations were essential since Asiatic cholera was “more fatal among the weak, ill fed, intemperate and filthy.” As this example illustrates, food restriction and regulation in the late 19th century centered on guarding health, not achieving physical beauty. Lulu Hunt Peters was born in Milford, Maine and acquired her medical degree from the University of California in 1909. Peters became the chairperson of the Public Health Committee of the California Federation of Women’s Clubs, Los Angeles District before writing Diet and Health and Key to the Calories. Weighing approximately 200-220 pounds at her heaviest, Peters lost 70 pounds by following her strict caloric guidelines, and then went on to be the columnist for “Diet and Health” which was published in The Los Angeles Times. Peters’ book sold approximately two million copies, and remained in continuous publication for over twenty years. Ads for her book appeared everywhere, from the Chicago Daily Tribune to Vogue. Her book is also credited with being the first modern American diet book, and spurring a generation of calorie counting and fad dieting. Diet and Health, published in 1918, imbibed a patriotic language in the midst of World War I. According to Peters, “in war time it is a crime to hoard food, and fines and imprisonment have followed the exposé of such practices. Yet there are hundreds of individuals all over America who are hoarding food, and that one of the most precious of all foods! They have vast amounts of this valuable commodity stored away in their own anatomy. Peters announced that it was unpatriotic to be overweight. Peters suggested forming the “Watch Your Weight Anti-Kaiser Class,” a program eerily reminiscent of weight-watchers meetings, except that those who failed to lose weight each week were fined—with the proceeds given as a donation to the Red Cross. While patriotism may have been in the background, the point of Diet and Health was clear—fatness resulted from overeating and under-exercising. While Peters acknowledged that genetics played a role in physique, she believed the decision to be fat was left, ultimately, to the individual. In Diet and Health and her later column in the Los Angeles Times, Peters urged her readers to reduce intake and food to numbers of calories, essentially mathematizing diet, and popularizing the concept of calorie-counting. In 1918, Rob Wagner wrote Film Folks: “Close-Ups” of the Men, Women, and Children Who Make the “Movies” in which he essentially broke down, into digestible chapters, the conventional roles and plots of the movies. One chapter, titled “The Movie Queen,” was much longer than the rest. When searching for “potential Juliets,” appearance was incredibly significant. Studios and employment bureaus asked girls for the name, phone number, address, age, height, weight, hair, chest, eyes, waist, nationality, wardrobe and previous experience. After they took this information, the girls were “filed away under various heads, such as matrons, young girls, children, chorus types, fat, [and] thin…” to be called upon when a particular opening requires. The nascent film companies attempted to keep their stars anonymous—to prevent them from becoming too popular and asking for higher pay. 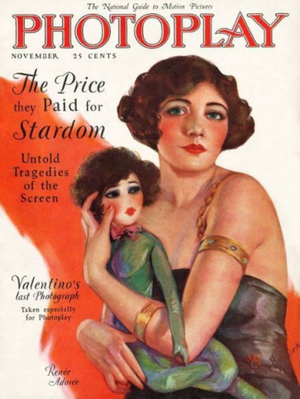 However, when Carl Laemmle, a film-trust opponent, began to lure actresses from other companies (promising publicity and fame) stardom skyrocketed. Once film consumers knew actors and actresses by name, film stars became trademarks for products and salaries rose. As salaries increased, requirements for actors and actresses did as well.